Pioneer DJ expands its family of Serato® DJ Software controllers with the DDJ-SZ, its flagship model that strongly emulates the look and feel of Pioneer's world-renowned CDJ digital players. The DDJ-SZ is designed for the serious "controller" DJs who are inspired by the performance specifications of Pioneer's professional DJ products but also want the convenience of an all-in-one system. The new controller is 35 percent bigger than the widely popular DDJ-SX, sporting additional functionalities and features including extra large JOG wheels (the same size available on CDJ players), large performance pads with multi-color illumination, DJM style mixer, dual USB ports and a MAGVEL cross fader. The most noticeable CDJ PRO gear integration to the DDJ-SZ is its large 8.1-inch JOG wheels. The JOG wheels provide instantaneous response and excellent operability for accurate and smooth scratching and mixing performance. The center of each JOG wheel also features "ON JOG display" to illustrate playback status, cue points and position. In addition, the unit offers a JOG FEELING ADJUST to enable users to change the resistance of the wheel from light to heavy for a customize feel. Directly below each JOG wheel are four effects buttons – HOT CUE, ROLL, SLICER and SAMPLER. Under the effects buttons are eight extra large "performance pads" that DJs can quickly access to insert different modified effects to music playing. In Sampler mode, the output volume of the sampler effects also varies depending on the strength of user's tap of the pad. An update from the current DDJ-S controllers, the performance pads on the DDJ-SZ illuminate in different colors to quickly communicate the effect mode it is in. The mixing area of the DDJ-SZ also closely mimics Pioneer's DJM series of professional mixers, utilizing a generous number of controls and effects with features including Sound Color FX and new Oscillator functions to deliver more creative music arrangements. The mixer can also be used as a standalone 4-channel mixer for outboard players and turntables. Sound Color FX – The mixer includes four Sound Color FX functions (Pitch, Jet, Echo and Filter), which add numerous audio effect combinations and arrangements to currently playing music with a simple twist of the knobs. Through Serato DJ's beats per minute (BPM) analysis, users can also synchronize Echo effects to the BPM of currently playing music. For extremely smooth transitions and high durability between the DDJ-SZ's players, the unit features a MAGVEL cross fader (the same component used in Pioneer's DJM-900SRT) that utilizes a contact-free magnetic system that can withstand more than 10 million operations. The "cut in" time of the cross fader can also be customized to the user's preference. Taking a lead from technology and know-how cultivated through development of professional DJ equipment, the DDJ-SZ is a DJ controller with the same level of operability as Pioneer's professional DJ equipment. 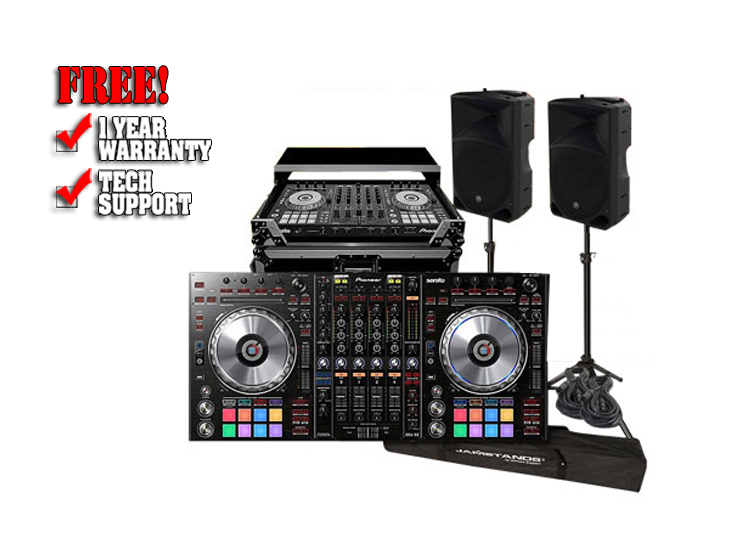 Authentic DJ performances can be given as though playing with a component DJ system combining multi-player and mixer. The DDJ-SZ features a "BIG JOG" with a diameter of 206mm – the same as that of the "CDJ-2000NXS" pro DJ/club-oriented multi player – with excellent operability. Precise scratch performances have been made possible with the inclusion of an "ON JOG DISPLAY" in the center of the JOG, showing the playback status and position. The popular "JOG FEELING ADJUST" feature from the CDJ series also returns, so users can adjust to their liking the control load and continuous backspin time, etc. during scratch performances. The DDJ-SZ also features the industry's fastest JOG response time (the time from operation of the JOG until the operation signal is transmitted to the software), enabling scratch performances exactly as intended. Large rubber "PERFORMANCE PADS" have been positioned at the front of the unit for control of functions such as HOT CUE and SAMPLER. As well as being able to apply arrangements to music with dynamic actions such as hits and rolls, the audio volume of these actions can be made stronger or weaker depending on the strength with which the pads are hit. Also, the color and on/off status of the multicolor illuminations built into each pad make it possible to determine the mode of the selected pad and the performance status of all pads at a glance. The DDJ-SZ is equipped with an "OSCILLATOR" that emits four types of sound (NOISE, SIREN, CYMBAL, HORN). Simply select the type of sound you want to output and turn the knob to produce new developments in the music by overlaying sounds on top of the music being played, further emphasizing exciting parts of the music, and so on. The DDJ-SZ includes four types of "SOUND COLOR FX" functions (PITCH, JET, ECHO, FILTER), which are a popular part of the DJM series. Various effects can be added to the music simply by turning the knob, opening up the possibility of a diverse range of remixes. It is also possible to synchronize ECHO to the BPM of the music being played by obtaining BPM information from "Serato DJ". In addition to 4-deck and sampler functions, the latest "Serato DJ"DJ software from Serato also comes with "SLIP MODE", and FX powered by iZotope to arrange tracks in a wide variety of styles. ⋅8hot cue points can be set in each deck. ⋅Vertical waveform display to visually sync the tempo. All buttons and knobs, as well as the soundcard*2, are "PLUG AND PLAY" – configured in advance to work with "Serato DJ". P-LOCK Fader Caps are impossible to pull off in the heat of a mix. Auto Standby" function switches to standby mode when a state of no use or no input continues for a certain period of time.